The TRENCH'N edge irrigation trencher was specifically designed for radial aeration by removing unwanted dirt from the root zone. 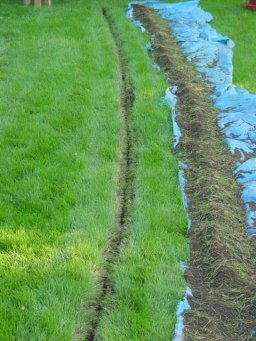 The trencher blows the trenched material onto tarps for easy removal and disposal. Below is an informative article written as a consumer information bulletin by the International Society of Arboriculture. Please click here to obtain the full article, then close the window to come back to the TRENCH'N edge website. This article is reproduced with the permission of the ISA. More recent research has shown promising results with another method of aeration called radial aeration. Narrow trenches are dug in a radial pattern throughout the root zone. These trenches appear similar to the spokes of a wagon wheel. It is important to begin the trenches 4-8 feet from the trunk of the tree to avoid cutting any major support roots. 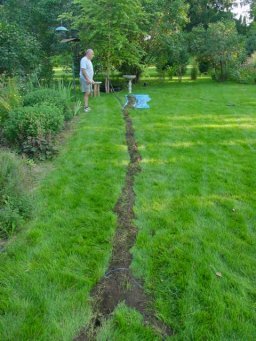 The trenches should extend at least as far as the drip line of the tree. 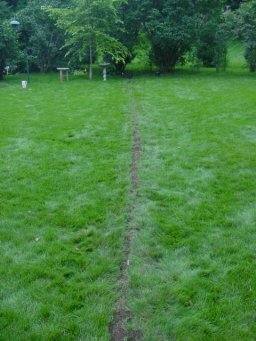 If the primary goal is to reduce compaction, the trenches should be about 1 foot in depth. They may need to be deeper if the soil grade has been raised. This technique is appropriate for isolated trees, where the roots of other trees would not be damaged. Compaction of the soil and increases in grade both have the effect of depleting the oxygen supply to tree roots. If soil aeration can be improved, root growth and water uptake can be enhanced. 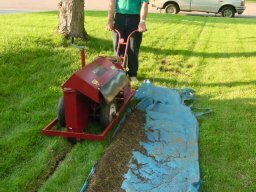 The most common method of aeration of the root zone involves drilling holes in the ground. Holes are usually 2-4 inches in diameter and are made about 3 feet on center, throughout the root zone of the tree. The depth should be at least 12 inches, but may need to be deeper if the soil grade has been raised. Sometimes the holes are filled with peat moss, wood chips, pea gravel or other materials that maintain aeration and support root growth. This is called vertical mulching. Holes are drilled throughout the root system to improve aeration.